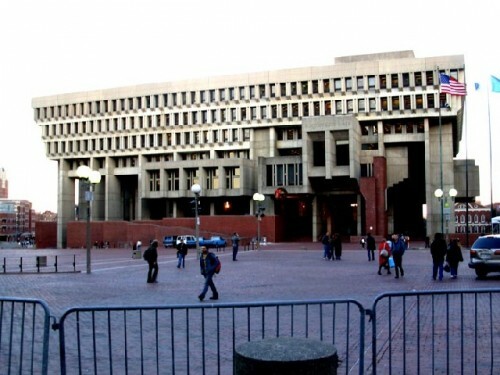 The 1968 Boston City Hall designed by Kallman, McKinnell and Knowles has been declared obsolete. The curved building echoing the Sears Crescent bordering Government Center just doesn't cut it. The undistinguished Federal building of Government Center. The Sears Crescent is all that remains of the Old Scollay Square. At the edge of City Hall looking down on Faneuil Hall and Quincy Market. The West End was demolished as a part of Urban Renewal. 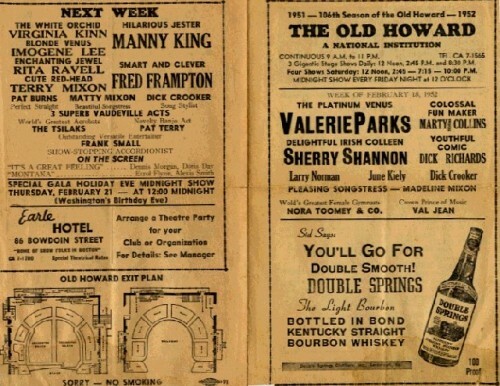 The Old Howard featured variety and strippers. Ann Corio was regarded as the queen of burlesque. 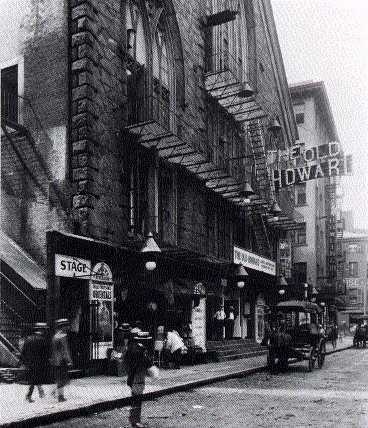 Gypsy Rose Lee performed at the Old Howard. 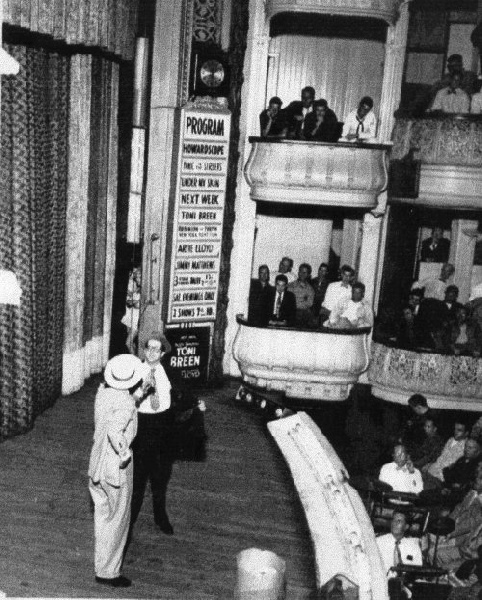 Comedian Phil Silvers on stage at the Old Howard. A program for the Old Howard. 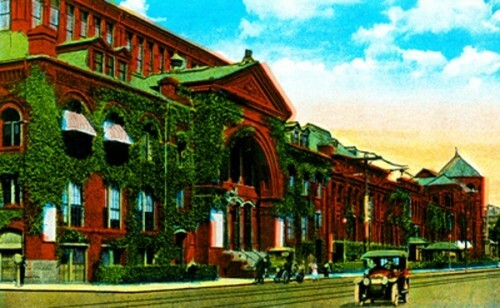 Mechanics Hall on Huntington Ave was replaced by the Hynes Convention Center. 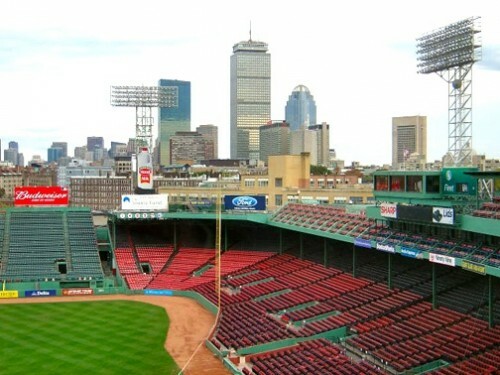 Fenway Park is an enduring landmark of historic Boston. Copley Square has endured an extreme makeover. The New ICA is a magnet for future waterfront development. Hard on the heels of the euphoric media christening of the new Institute of Contemporary Art building on the Boston harbor waterfront came the shocking news that Mayor Thomas Menino proposes selling City Hall, the centerpiece of the vast brick Government Center Plaza, and relocate to the area which, while it now has key elements including the Court House, Convention Center, World Trade Center and the ICA, as well as the landmarks Anthony's Pier Four and the No Name Restaurant, is still in a relatively early stage of development. 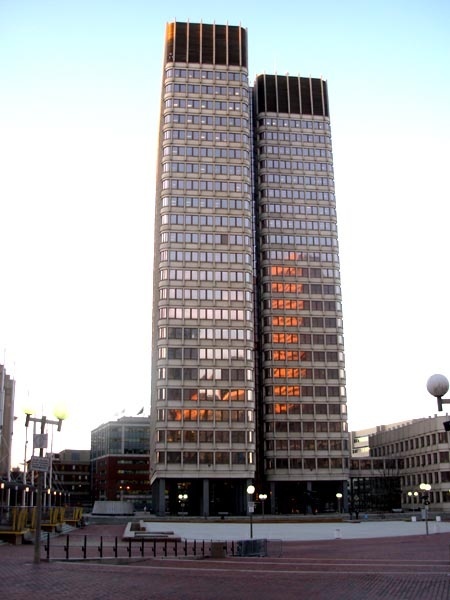 This proposal represents the official declaration that the Kallman, McKinnell and Knowles inverted ziggurat, rough concrete design in the Art Brut style which was considered cutting edge, and a symbol of the New Boston, when it was completed in 1968, is now regarded as a disaster and eyesore. It is the all too familiar story that the avant-garde icon and urban statement of one generation becomes the albatross of the next. In the Post War era of my youth Boston lagged far behind other major Northeast cities in the area of economic development. There was a gray patina cast over the city which had once been among the most progressive and enlightened particularly in attracting centuries of America's finest architects and urban designers who were often inspired to create their greatest works. It was no small statement to regard Boston as The Hub or Athens of America. It was an intensely ethnic, some would say racist, city with proud neighborhoods eager to bash each others brains in during annual Thanksgiving football games. There was Irish Southie, against Italian Eastie. Smart Latin School, the nation's oldest public school founded in 1635, pitted against English, home to Latin's dropouts and wannabes. The North end had seen waves of immigrants finally settling on the Italians. The West End was a truly diverse, multi cultural neighborhood. The Chinese established Chinatown as strike breakers working the nearby garment and leather district. Jews migrated in waves from the South End to Roxbury then Mattapan and Milton. Behind them came the Arabs and then blacks. Beacon Hill and the Back Bay remained staunchly Brahmin until they gradually moved to South Brookline, Chestnut Hill then on to Newton, Wellesley, Lincoln and Lexington. Dorchester was partitioned between upscale Melville Park with its Victorian mansions and the Irish in triple deckers which flourished to the point where they were known as Boston Weeds. It was a perfect option for the working class. Own one floor and rent the other two. In the Post War era Boston was still under the spell of Irish politicians from the legendary Honey Fitz, father of Rose Kennedy, through the dishonorable, James Michael Curley, the Rascal King. In the city where signs in windows advertising jobs stated that "Irish Need Not Apply" they took charge leading to the now fading but still colorful Brothers Bulger, Whitey the Hood, and the Triple Eagle, retired, politician Billy. The marvelous film Departed richly captures the ersatz Bulger ambiance. The Irish politicians gradually made room for Italian governors named Furcolo, Volpe and Cellucci and the current Mayor For Life, as some call him, Mumbles Menino. and lower Washington Street with its peep shows, flop houses, tattoo parlors, bars and ancient book stores. I bought my first trot (interlinear translation) of Caesar's Gallic Wars in one of those stores. It was a well used copy and I was scared that someone would rat me out. The book stores would shake rattle and roll when the train passed under. It just added to the atmosphere. Later, when an teenager, after the annual Schoolboy Parade which ended at noon in Copley Square, we would head en masse to the Combat Zone, or take in the show at the Casino with its day long rotation of variety acts, jugglers, dogs, magicians, those wonderful comics with ancient jokes, and the chorus line of strippers. The venerable Old Howard had by then been consumed by a "fire of mysterious origin." But the theatres were legendary for their great stars from Ann Corio and Gypsy Rose Lee, before my time, to our generation's Tempest Storm. 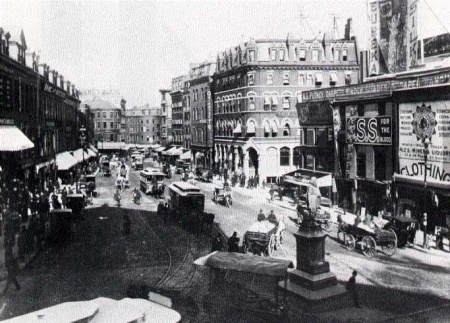 During World War Two every soldier and sailor knew of Scollay Square. They fought and brawled so often that the area became known as the Combat Zone. 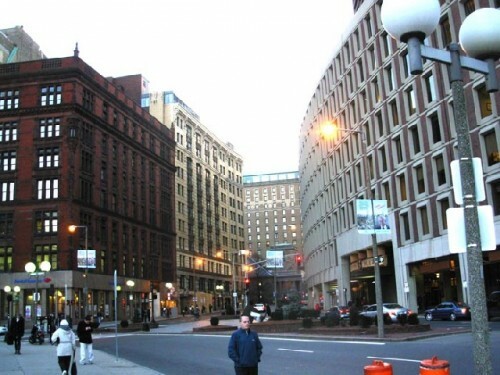 Gradually it found its way down Washington Street which was initially the retail and theatre district of town. There was the scruffy old department store, Raymond's, "where you bot the hat" to Filene's, now closing except for the Basement, Woolworth's, and Jordan Marsh, now Macy's. 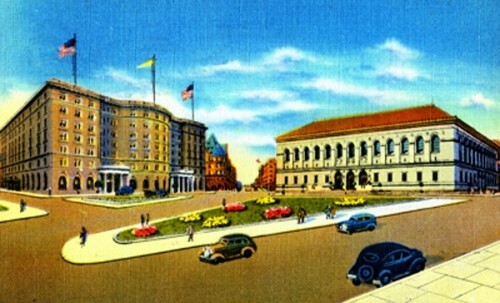 On Sundays the family would drive in from Brookline, dine at the Nile, and then cruise up the street checking out the theatre marquees at the Pilgrim, Paramount, Savoy, Modern, Metropolitan (now the Wang Center). I loved the Laugh Movies which had wonderfully distorting mirrors out front that made you larger or smaller like Alice in Wonderland. Sometimes Mom would prevail and we would end up at the Exeter Street Theatre in the former Spiritualist Temple, home of the sÃƒÂ©ance table thumpers, which featured the British comedies of Alex Guinness and Terry Thomas. Downtown was an area Mom knew well but didn't like to talk about. My Irish grandfather, James Flynn, owned bars and hotels including Boston's biggest establishment, The Silver Dollar Bar, which later became the Two O'clock Lounge and is currently the site of the Registry of Motor Vehicles on Washington Street. During prohibition he was a bootlegger who drove cases of whiskey in the Pierce Arrow down from Canada through Smuggler's Notch in New Hampshire. He was a minor league rum runner while the Kennedys were big time. But he went bust during the Great Depression. In March of 1965, Monsignor Francis J. Lally, Chairman of the Boston Redevelopment Authority, submitted a letter and plan to Mayor John F. Collins which says in part "The 1952 ordinance set the aims of the City's General Plan as the promotion of the coordinated improvement and development of the City and the promotion of the health, safety and welfare of its inhabitants. We believe that this General Plan amply fulfills both purposes and we are pleased to commend it to your consideration at this time." Essentially it doomed the West End and later Scollay Square while erecting the Expressway through the city which has recently been replaced by the Central Artery Tunnel Project or "Big Dig" which started in 1991 and is now being "repaired." The cost is a staggering $14.6 billion with another $34 million to redo the mistakes that took a life when improperly placed ceiling panels fell and killed a woman. Now that this project is limping toward conclusion, although the criminal investigations and law suits will likely drag on for decades, Mayor Menino aspires to be the Edifice Rex of our time. Heck, why not consider City Hall a failed experiment and jump start to the waterfront. 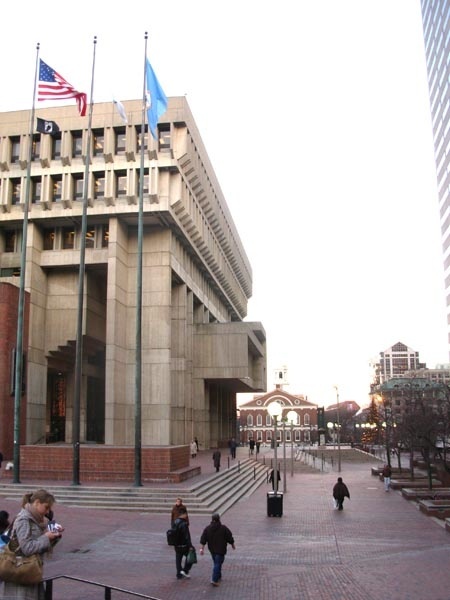 A new City Hall costs chump change compared to the Big Dig. The all too ready solution to the failures of Urban Renewal is to raze or relocate. The historic West End, a real and vibrant community, was replaced by several large, undistinguished, high rise apartment buildings. There was nothing to recommend that part of town other than an urban location and walking distance to events at Boston Garden. For years there were signs abutting the snarled traffic on Storrow Drive that proclaimed "If You Lived Here You'd Be Home by Now." 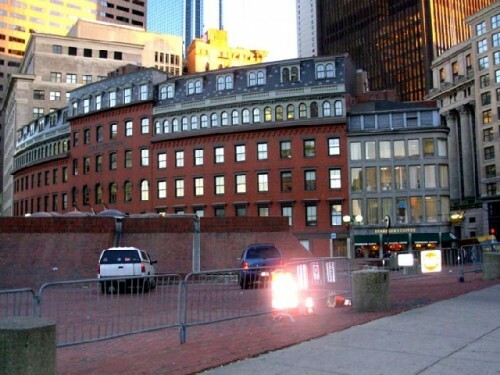 But now the historic Garden is gone replaced by the Fleet Center or whatever the heck they currently call it. Most true Celtics and Bruins fans miss the Garden with its warped parquet floor and obstructed view seats in the rafters. The Mechanics Hall on Huntington Avenue of my youth, home to the annual Boat Show and Auto Show was replaced by the Hynes Convention Center, AKA, The Darth Vader Building on Boylston Street. 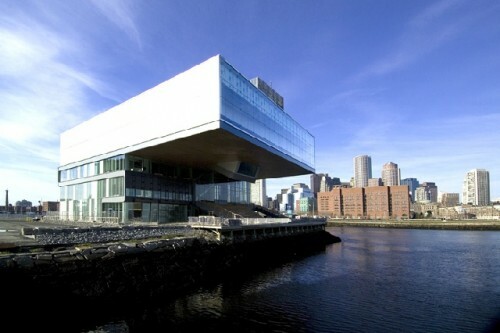 But it is now obsolete and replaced by the Convention Center in the emerging waterfront development. Which has been upgraded with a new Convention Center in the waterfront area. Fortunately new owners have thought better of knocking down Fenway Park the worst/ best ballpark in America. Boston continues to be a city that clings to and thrives on traditions. Otherwise it would be Cleveland, Cincinnati, Motown, or LA. The greatest and last to be developed resource of the City of Boston is its magnificent harbor and waterfront. After World War Two the city ignored the fabulous view and erected a brutal slum of Public Housing Projects in East Boston. It doomed the area to generations of struggle and poverty. It is ironic that the much touted views from the ICA and other harbor developments gaze across at working class Eastie. But that is changing as we speak. Eastie's Projects have been leveled and replaced by a smartly designed, mixed income, neighborhood of town houses. Ground is being broken on an upscale marina and condo complex on the former Pier One which abuts the city's finest new treasure Pier's Park. In the thirteen years since we bought into the neighborhood property equity has climbed by an average of 500%. Another surge is anticipated upon completion of the harbor development. It is interesting that the ICA is playing a role in this equation. The Mayor who has boldly backed and godfathered its move sees it as a jewel in the crown and prestigious magnet for a yet to be fulfilled development of high rise condos, shops, and businesses. Back in the era of Mayor Kevin White and the new, now old City Hall, the then dead ICA found new life. It was backed by Kathy Kane, who worked for White, Louis Kane, later founder of Au Bon Pain, who chaired the ICA board, and an energetic young ICA director, Andrew C. Hyde. Not only did White and the Kanes back the ICA, for a time, it had gallery space in City Hall. Later Hyde, after resigning and then briefly returning to the ICA, brokered a deal to secure a long term lease and eventual ownership of the former Police Station on Boylston Street. It has now outgrown that space. And what of the new ICA in its acclaimed building by Diller, Scofidio and Renfro? Once the euphoria cools off how long will it take for the bold cantilevered design to begin to look like a clichÃƒÂ©? Will there be talk of filling in the space under the overhang because the landlocked footprint of the building has nowhere to go? Will people begin to face up to the fact that its best viewing point is from the harbor? Perhaps they will move the Swan Boats from the Duck Pond in Boston Garden so that tourists might get the best impressions of the building. When will the building outgrow its expanding permanent collection? And where will they store and conserve it? Is there a lot of wasted space in the lobby? But, more importantly, who will come to a remote and inaccessible part of the city? It seems all too much like the Museum of Modern Art in Montreal. It was located on a jetty near Moshe Safdie's Habitat. But nobody went there. It was just too hard to get to. Eventually the building was abandoned and the museum was relocated to the heart of the city on Saint Catherine Street. If the ICA averaged 25,000 annual visitors on convenient Boylston Street how can it now expect to punch numbers to keep up with its assumed debt and increased operating expenses? Perhaps, eventually when new development occurs according to Mayor Menino and his visionary backers. But between now and then could represent hard times for the ICA and the city as a whole. As razing the West End and Scollay Square all too aptly demonstrated, knocking things down, relocating, and starting over doesn't really work. It can rip the heart and soul out of a city.